Total now at 118, with more to add. 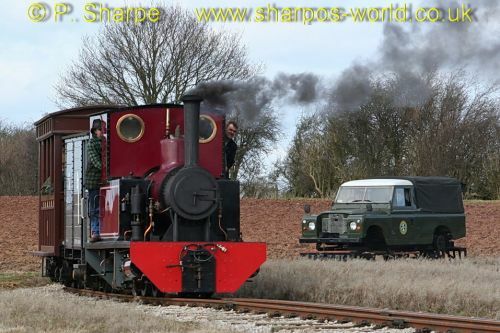 A few photos with a Land Rover (on the narrow gauge) and a train in the same shot, like this…. This entry was posted in Sharpo's World Photo Updates on March 31, 2010 by Sharpo. I’ve started sorting the photos and will be uploading in small batches. The ones from later in the day will be added first, so if you call back in a day or two the newer ones will be at the front of the album, depending of course on the order you set them to be displayed. Once all the photos are uploaded a few comments will be added, so in the meantime – enjoy the photos. This entry was posted in Sharpo's World Photo Updates on March 29, 2010 by Sharpo. Seen today around Arley. 5164, 6695, 7802 & 7812 on service trains, also 42968 on Footplate Experience. 5 locos in less than 90 minutes is how I like it!! 3 were “backwards” though! This entry was posted in Severn Valley Railway on March 28, 2010 by Sharpo. Spent an enjoyable day at the above railway. 11 locos were in steam, and a Land Rover converted to run on narrow gauge track was also running. This entry was posted in "Other" railways on March 27, 2010 by Sharpo. It packed up a couple of days ago, the fan worked & it blew hot air – but the drum didn’t turn. Must be the belt or drive motor, I thought. Should be easy to fix, says he hopefully! Took the back off, saw a fan, but no sign of a drive belt. I was stumped! Searched the internet, others had asked how to replace the belt, but there were no answers as to how it was done. So, find more screws to undo & have a poke around. In the end, I only managed to access the “insides” by easing open the whole front of the dryer & having a look inside. I could see the drive for the belt was taken from the shaft which also drove the fan. Fortunately I was able to get a replacement belt & with much struggling managed to fit the belt round the drum and tension pulleys and onto the drive shaft. Turning the fan blades by hand showed that the drum would also rotate again, then put it all back together, finally, plug in, light blue touch paper & retire (no, forget that bit) meant to say – turn timer to start it & hope it works. Yes, it now works. Belt was £8 and considerably cheaper than a new tumble dryer! This entry was posted in Uncategorized on March 27, 2010 by Sharpo. The standard sitemap only lists the “posts”, but a plugin is available which can be set to list “pages”. Hopefully this will be useful, but as with the other sitemap – I don’t know if it automatically updates itself. This entry was posted in Uncategorized on March 26, 2010 by Sharpo. I don’t know if the page will update automatically, or if it stays as it was the day the sitemap was created. No doubt I’ll soon find out! This entry was posted in Uncategorized on March 24, 2010 by Sharpo. This entry was posted in test and tagged cradley, gloucester, kidderminster on March 24, 2010 by Sharpo. I’m quite good at uploading photos to galleries, but can never keep the accompanying web site pages updated. So perhaps it is time to move away from the old style sites and add the pages to this blog instead. It looks like it will be quicker & easier for me to use the blog and hopefully just as easy for visitors browsing through the pages. This entry was posted in "Mostly Midlands" gallery on March 24, 2010 by Sharpo. This entry was posted in Severn Valley Railway on March 21, 2010 by Sharpo. I wasn’t paying attention today, eating my lunch in the buffet when 7802 arrived at Bewdley on Driver Experience. Then I was caught out supping my tea as 5164 arrived with a train from Bridgnorth, earlier than I expected. The other train I saw was hauled by 43106, now facing Bridgnorth. 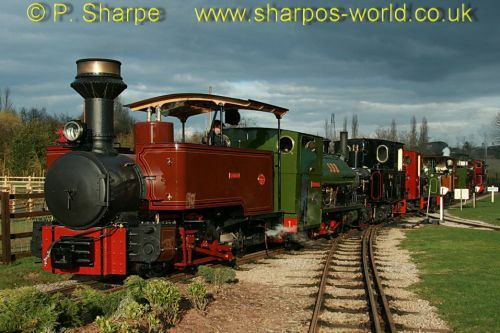 This entry was posted in Severn Valley Railway on March 20, 2010 by Sharpo. After appearing at the SVR Reunion Gala, 61994 returned to Crewe today, and is seen climbing through Old Hill. Almost messed up the shots as the camera was set to timer – something that often happens when I fumble around in cold weather, and I can’t see the camera settings without glasses. I’m relieved these photos came out, as the rest of the day was a disaster – the shunt at The Engine House was cancelled & the “nuke” ran via the Lickey instead of Cradley, where I was waiting. This entry was posted in Sharpo's World Photo Updates on March 16, 2010 by Sharpo.